One more from this batch, just so we can all enjoy the sparkly dresses. Who doesn’t love a sparkly dress? 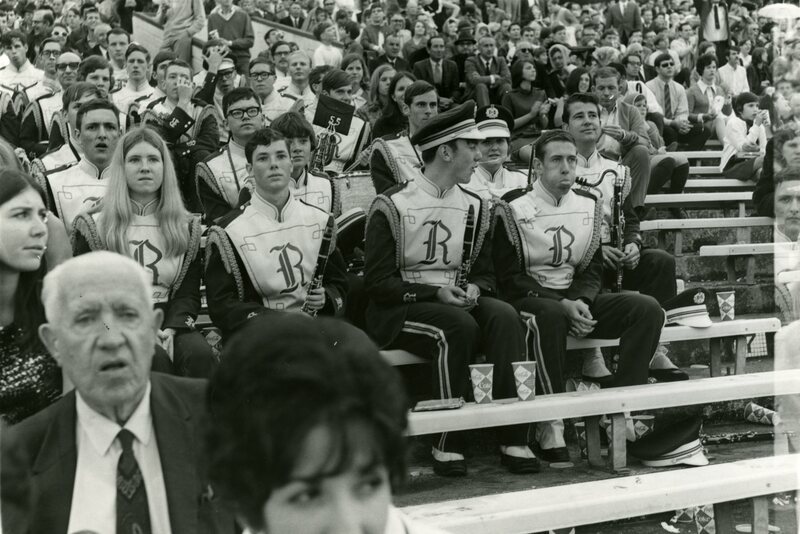 Many familiar faces in these Rice Band photos. The lady with long straight blonde hair who is in both is Dawn Pennington. The twirler with short dark hair in the bottom photo is Dodie Worboys. The fellow at the left edge of the bottom photo, 4th row up, is Brian Martin. The fellow sticking his tongue out is very familiar, but I can’t confirm the name in my Campaniles (yet). Both he and Dawn are shown in the 1969 Campanile’s Band photos; his looks like it was part of the same photo shoot. Men wore ties to football games in the late 60s. Wow. Yep! That was a big surprise to me, too, especially given the hot/muggy weather for early season games. (I came from the Washington, D.C. area.) Game day dress was even fancier at SEC games. Guys were always supposed to get a big Mum (chrysanthemum) corsage for their dates, not just at Homecoming. I sure didn’t! I spy Victoria Fosbrooke Pearson (Reed) in the shiny uniform in the lower photo in the lower left. I’m not really sure how to spell Fosbrooke but I used to call her that in High School. 1968? Sure is a lot of short hair on the guys for 1968. Certainly no earlier than ’67 – the year that Bert became the director. The bass clarinet player on the right is Brenard Braker, who was then the band director at HISD’s Black Junior High, and a close friend of MOB director Bert Roth. I like the fingertip-less white gloves tucked through the epaulets on the uniform overlay. White gloves were still worn with the OwlTails uniforms when I started in ’73. 68 is the appropriate year, but since the band only traveled to two away games (SMU and A&M), the stadium almost has to be the Cotton Bowl (fans are seated). Other away games were Washington, Arkansas, and Baylor. The Cotton Bowl never had brick vomitories in the first deck. That no one is standing might be because the band is surrounded by Rice fans. 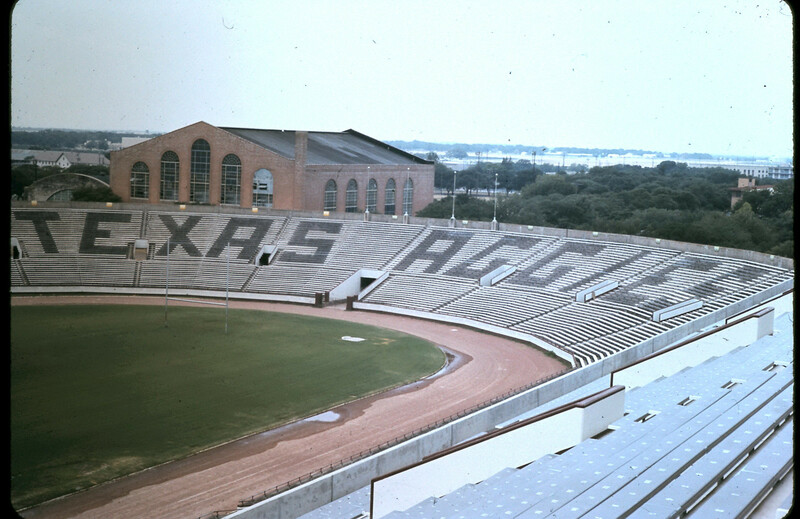 This photo of Kyle Field “circa 1968” (http://i.imgur.com/Ka6Pkza.jpg) shows ramp wells that look the same as those in the Rice Band photo above: white walls with dark caps/borders on top. Also the row markers (on the vertical surfaces of the aisle-steps between seating sections) appear to be narrow in both photos. (They’re fuzzy in the linked photo, but visible when you zoom in on the left side, near and in the “TEXAS” seats). One difference: The individual seat numbers on the metal benches (foreground) appear to be white in the Kyle Field photo, but dark in the Rice Band Corner photo above. BTW, the Cotton Bowl’s Wikipedia page said its seats were changed to chair backs in 1968. Also, its white-backgrounded row markers appear in this video of the 1968 Cotton Bowl (https://www.youtube.com/watch?v=BrNhJsG665Y) @ 13:55 & 14:06) to be much wider than that in the Rice Band photo. Think the guy making faces may have been Fritz Untermeyer (no longer sure of the spelling) and yes, that’s me with the long hair. I don’t think that’s Fredric J. (“Fritz”) Attermeier. CPA, JD, MS, LL.M. Not sure who else it could be (this is, “before my time”), but Fritz was still visiting Bert a lot during my time. Farther back in the picture, the person jamming on his hat may be Guinn Unger, and I believe the mustachioed person behind (the possible) Guinn and to our right may be Nelson Hatt. I found him in the 1969 Campanile: Scott Wagner. The fellow next to him (and smiling at the far-right of the second photo) is Stephen Gilbert. Both were in Baker. 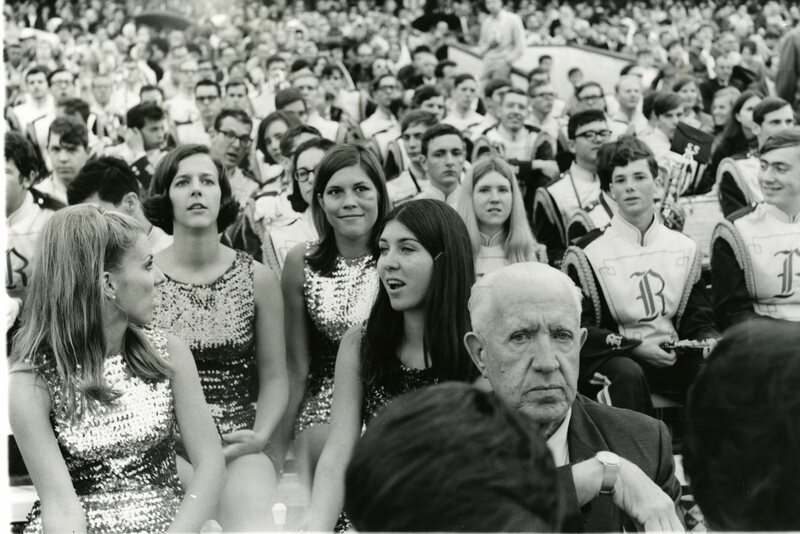 I think the guy in the black glasses just in front of Don Guinn may be John Wise, Hanszen ’70.